This October, luxury diamond jewellers ROX launched their brand new AW17 magazine at a glamorous dinner hosted in the stunning 'Thrill Room' located in their Glasgow store. To make sure the event was executed to the highest standard, ROX brought in the services of Rusk & Rusk to create an utterly bespoke dining experience for their guests...a big, exciting challenge which was a huge success. Rusk & Rusk are no strangers to events, boasting endorsements for their in-house events from Grazia, Candid Magazine and Marie Claire to name but a few. However, external event support is a relatively new addition to the companies profile for 2017, and executing the ROX AW17 Magazine launch was another feather in the cap. The chef team at Rusk & Rusk were given the task of creating a bespoke 3 course, astrological themed menu that complimented the products on show at the event. 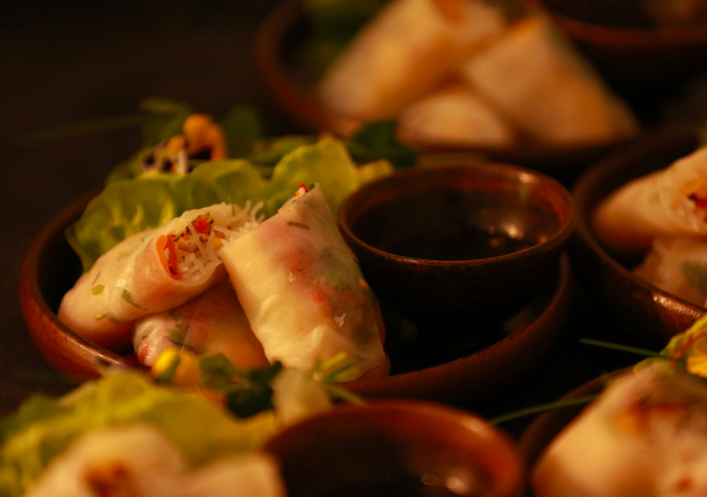 Vietnamese rolls with wild flowers, yuzu & ginger dipping sauce were up first; a gorgeous fusion of intricate flavours with bold presentation. For the main course, seasonality was king, and the chefs served up aged loin of Highland venison with celeriac espuma, girolles and cocoa game jus; Scottish provenance at its finest. No dinner is complete without dessert, and guests were treated to a chocolate delice with white chocolate nougat, black cherry sorbet and cocoa nibs in a distinct sun/moon mould. Dressing the room was a glorious task; the Thrill Room at ROX is a truly stunning space and so the mandate was to simply accentuate that beauty. A classic, glittering table decor of white linen and sterling silver complimented the crystal stemware. With a number of marquee events on the horizon, it's going to be a busy winter for Rusk & Rusk!